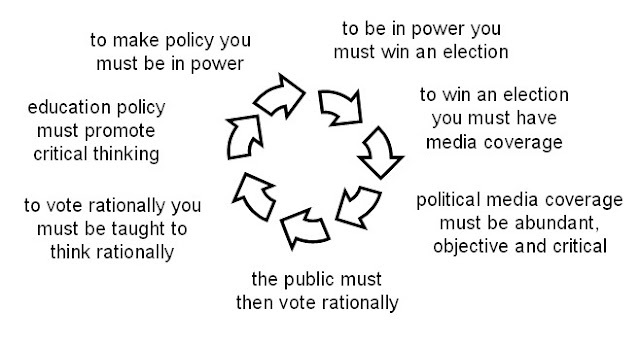 An exchange on twitter with @PhilRandal led to the following summary of the vicious circle of pseudodemocracy. Any attempt to effect genuine democratic change within a pseudodemocracy such as the UK will ultimately be thwarted by a dysfunction in one or more of the elements of this circle. There are just so many examples of this but a few prominent ones include the AV referendum, the constant flux of absurd, ideological policy spewing forth from the department of education, the Leveson Report, the Jenkins Review, limitation of media coverage to controversial figures such as UKIP and the BNP and not the greens or the SNP, etc., etc. Anyway, I said to Phil that I should come up with a pithy jargonism to use as a hashtag on twitter to refer to this but then I realised that the tagline on this blog was about as succinct as you could make this. I also use too many obscure jargonisms as hashtags on twitter already so until I come up with something better I'll just stick with my old favourite #Duhmocracy. Are you back in Plymouth - can't be two people with black Darwin t-shirts. Ha! No. Not me old chap. Must be my evil* twin.